You searched for set-off - В сложной финансовой ситуации приходит на помощь кредит наличными в Казахстане. Set-off is a popular topic or defense raised in civil disputes. In contract actions, set-off must be raised as an affirmative defense and proven at trial (and determined by the trier of fact) or else the defendant waives the right to assert set-off. See Felgenhauer v. Bonds, 891 So.2d 1043, 1045 (Fla. 2d DCA 2004). What about tort actions such as negligence actions in disputes involving personal injury or property damage? For instance, say a plaintiff sues three defendants in negligence for the same damage. Prior to trial, the plaintiff settled with two of the defendants for a total of $100,000 and gave the defendants releases. The remaining defendant proceeds to trial but a) thinks its liability is no more than $100,000 and b) wants to reap the benefit of the $100,000 already obtained by the plaintiff from the other two defendants. In tort actions, set-off is not an affirmative defense to be determined by the trier of fact “but is a determination regarding damages to be made by the court after the [jury] verdict is rendered [in a jury trial].” Felgenhauer, 891 So.2d at 1045. (1) A written covenant not to sue or release of a person who is or may be jointly and severally liable with other persons for a claim shall not release or discharge the liability of any other person who may be liable for the balance of such claim. (2) At trial, if any person shows the court that the plaintiff, or his or her legal representative, has delivered a written release or covenant not to sue to any person in partial satisfaction of the damages sued for, the court shall set off this amount from the amount of any judgment to which the plaintiff would be otherwise entitled at the time of rendering judgment. (3) The fact that a written release or covenant not to sue exists or the fact that any person has been dismissed because of such release or covenant not to sue shall not be made known to the jury. (1) A release or covenant not to sue as to one tortfeasor for property damage to, personal injury of, or the wrongful death of any person shall not operate to release or discharge the liability of any other tortfeasor who may be liable for the same tort or death. (2) At trial, if any defendant shows the court that the plaintiff, or any person lawfully on her or his behalf, has delivered a release or covenant not to sue to any person, firm, or corporation in partial satisfaction of the damages sued for, the court shall set off this amount from the amount of any judgment to which the plaintiff would be otherwise entitled at the time of rendering judgment and enter judgment accordingly. (3) The fact of such a release or covenant not to sue, or that any defendant has been dismissed by order of the court shall not be made known to the jury. Typically, these set-off statutes apply when the plaintiff received money from a defendant / tortfeasor who was vicariously liable for the other defendant’s acts. Felgenhauer, 891 So.2d at 1045-46. (The vicariously liable party is responsible to the plaintiff to the same extent as the primary [defendant] actor; both are jointly liable for all of the harm that the primary actor has caused. See Grobman v. Posey, 863 So.2d 1230 (Fla. 4th DCA 2003)). Stated differently, “[s]ettlement proceeds must be set off against the jury verdict where defendants [the settling defendant and non-settling defendant] are liable for the same injury.” Yellow Cab Co. of St. Petersburg, Inc. v. Betsey, 696 So.2d 769, 772 (Fla. 2d DCA 1996). The objective is to prevent the plaintiff from obtaining a windfall by obtaining overlapping compensation for the same damages. Cornerstone SMR, Inc. v. Bank of America, N.A., 163 So.3d 565, 569 (Fla. 4th DCA 2015). But, where there are separate and distinct claims involving different elements of damages, set-off is inappropriate. Gordon v. Marvin M. Rosenberg, D.D.S., P.A., 654 So.2d 643, 645 (Fla. 4th DCA 1995). 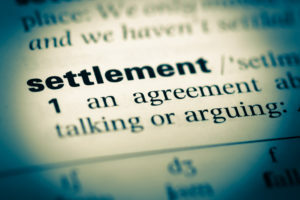 For this reason, when settling with one defendant in a dispute under different theories of liability /claims involving different elements of damages, it is important to allocate the settlement amount in the release agreement between the claims. “Where a settlement is undifferentiated and general [and not allocated amongst the claims], the aggregate of the amount of the settlement should be set off against the judgment [to prevent the appearance of double recovery for the same damages].” Cornerstone SMR, 163 So.2d at 569. Let’s break this down as applied to the above hypothetical. First, releasing the two defendants prior to trial does not operate as a release of the remaining defendant. Second, the court shall set-off any amount the plaintiff received from the other two defendants in the judgment the plaintiff receives since it involves the same damage, meaning the set-off would reduce the jury verdict and would be embodied in the final judgment. And, third, the fact that the other two defendants were released and then dismissed from the action in consideration of $100,000 prior to trial shall not be disclosed to the jury because this does not need to be proven at trial by the remaining defendant or impact any rulings at trial. I recently discussed a doctrine that applies in negligence cases known as the undertaker’s doctrine. Some may also call this the no good deed goes unpunished doctrine. Just kidding; but, this undertaker’s doctrine maintains that if you undertake a service, i.e., a good deed, you must do so with reasonable care as you assumed a duty to prevent the beneficiary of that service from harm. For instance, a tenant sued the owner of the condominium he (and his family) was renting and his real estate agent for water intrusion and mold problems in the unit. The tenant claimed the real estate agent was negligent because the agent agreed to fix the problems with the unit but neglected to do so. This is where the undertaker’s doctrine comes into play–the agreement to undertake a service exposed the real estate agent to a duty to use reasonable care with that service. The owner of the unit settled with the tenant for $82,000 resulting in a final judgment against the owner. The real estate agent argued that the negligence claim against him should be deemed moot in light of this settlement since the agent was being sued for the same damages. The appellate court disagreed because there was nothing in the record to reflect that the settlement amount with the owner included ALL of the tenant’s damages. “Mid-litigation monetary settlements are often less than the total amount of damages that the plaintiff was claiming. Each side gives up something when they settle, including some of the plaintiff’s potential monetary damages award.” Muchnick v. Goihman, 43 Fla.L.Weekly D986b (Fla. 3d DCA 2018). The settlement amount would serve as a set-off from any judgment amount or verdict awarded against the agent to avoid any windfall to the tenant; however, the agent does not get to put the cart before the horse and argue the case against him is moot because the plaintiff settled with the co-defendant.